Trenbolone E200 (Trenbolone Enanthate) is an injectable steroid containing 200mgs per ML of the hormone Trenbolone Enanthate. 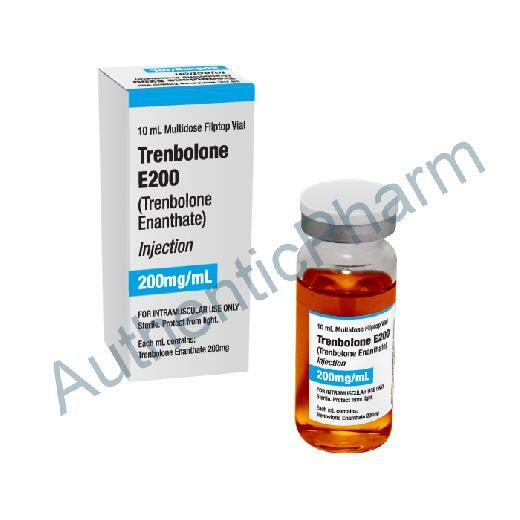 The Trenbolone Enanthate ester attached to this steroid makes it possible to keep blood levels steady with less frequent injections than if the bodybuilder was using the acetate ester of the drug. Athletes usually use a dosage schedule of twice per week with this product. Simply put, Trenbolone Enanthate is the most powerful overall steroid in use by bodybuilders today. Trenbolone Enanthate, as it is often called, is both highly androgenic and anabolic. It is chemically unable to aromatize, and therefore produces no estrogen buildup. This, along with its high androgenic properties, makes the muscle produced by this drug very hard and defined. Trenbolone Enanthate first got its reputation when it was used in the legendary steroid, Parabolan. Users of this drug often noted dramatic results that were nothing short of amazing, and after it was unfortunately discontinued, the remembered effects of the substance gave it cult like status and the market was flooded with bunk Parabolan amps by those looking to profit off the extreme popularity and fan base that this steriod's incredible results had sparked. Trenbolone Enanthate was also used in cattle implant pellets, where the substance was used to increase the lean mass of the cattle, while reducing the fat on the animals. Kits became widely available on the internet allowing bodybuilders to convert these pellets into injectable solution. Fina, as this homebrew oil was often called, quickly became a favorite of steroid users, like its relative, Parabolan, had done many years before. Users of Trenbolone E200 (Trenbolone Enanthate) often report amazing gains in both strength and quality muscle mass, while the fat and water seems to "melt" off. To give one an idea of just how powerful this hormone is as a muscle builder, please note that the powerful steroid Testosterone has an anabolic rating of 100, while Trenbolone Enanthate has a rating of 500! The drug is also a powerful fat burning aid, and lots of bodybuilders actually claim that the body will still drop bodyfat very quickly, even when one's diet isn't very clean. It is important to note that this substance will shut one's natural testosterone production down very quickly, thus making a proper PCT protocol a must upon conclusion of a cycle. Trenbolone Enanthate can produce all common androgenic side effects. It's also important to note that many users report uncontrollable night sweats while using this substance. To help combat this problem, it's recommended that users try to keep blood levels and stable as possible, and stay in a reasonable dosage range. Although this steroid can't convert to estrogen, some users do experience problems with progesterone related side effects, similar to those seen with products such as Deca Durabolin or Durabolin. Users sensitive to these issues may prefer to add Cabaser to their cycles. Trenbolone E200 (Trenbolone Enanthate) can be used in both cutting and bulking cycles. Those looking to bulk might add an injectable form of Testosterone along with an oral such as Methandrostenolone. The famous Trenbolone Enanthate /Test Propionate/ Winstrol stack is still regarded as one of the best cutting/ pre-contest combinations that there has ever been. This cycle, along with proper diet and cardio, is sure to bring about results that are extremely dramatic. Trenbolone E200 (Trenbolone Enanthate) is not a drug for women, as masculizing side effects are almost guaranteed. The typical dosage range for this substance is 300-700mgs a week for a period of 6-10 weeks.